Both devices will go on sale from February 7 and will so on sale from Amazon and Bose. The two devices also support Siri and Google Assistant. 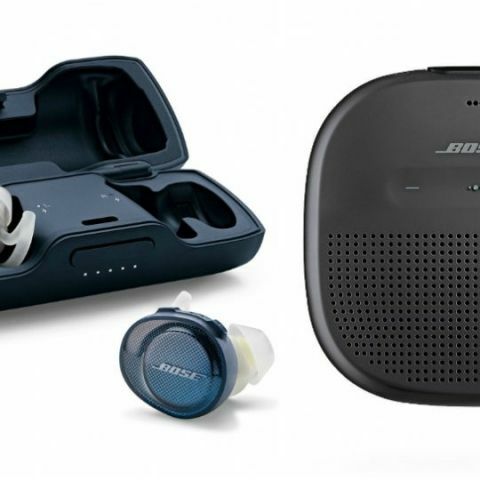 Bose has launched two new Bluetooth devices in India, the SoundSport Free wireless headphones and the SoundLink Micro Bluetooth speaker. The two are priced at Rs 18,990 and Rs 8,990 respectively. Both will go on sale via Amazon and Bose retail stores starting February 7 and will be available in Black, Midnight Blue and Bright Orange colour models. The SoundSport Free headphones are truly wireless and house new antennae for connecting with each other and a smart device. It weighs around 10g and come with a magnetic charging case, which not only holds them in place, but doubles as storage case. The company notes that the case itself can provide two additional full charges. Bose adds that the headphones can last for up to five hours on a single charge and can be tracked using the “Find My Buds” feature on the Bose Connect app. The app displays the last time and the places that the headphones were used. The SoundLink Micro Bluetooth speaker is the company's rugged, waterproof portable speaker. It can be paired via Bluetooth using voice prompts and comes with an integrated speakerphone and a multi-purpose button for calling. The device can also be connected with the Bose Connect app and paired with other SoundLink speakers for Stereo or Party Mode. The company claims that the speakers offer up to six hours of battery life. The SoundSport Free wireless headphone is IPX4 certified water and sweat resistant. It come with a “miniature acoustic package”, including Bose digital signal processing, volume optimized EQ, and feature the company’s proprietary StayHear+ Sport tips which the company says create a secure, firm fit that’s comfortable for hours. The SoundLink Micro Bluetooth speaker is IPX7 waterproof and features a new custom transducer and miniature dual-passive radiators. Both the devices support interaction with Siri and Google Assistant.